This webinar was originally recorded on August 30, 2016. Do you struggle to maintain control of your brand while also giving your teams and sales agents the flexibility to create their own marketing materials? 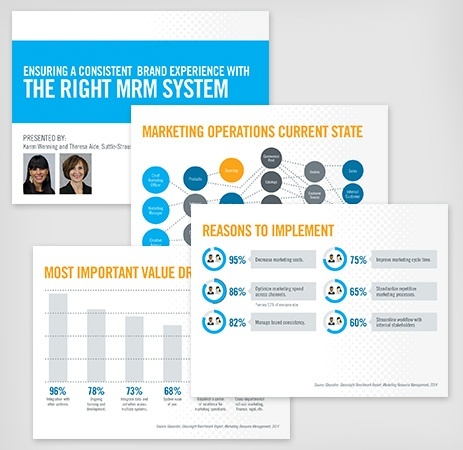 If so, this webinar will show you how a marketing resource management (MRM) system can streamline workflows and empower your users, while ensuring a consistent brand experience is delivered to your customers. Suttle-Straus provides comprehensive marketing solutions that incorporate creative design, mailing, fulfillment, distribution, wide-format, and conventional and digital printing services. Our S4 Marketing Resource Center (S4 MRC) is a marketing resource management system that combines these services into cutting-edge technology to advance your marketing abilities and speed to market. By automating processes, it streamlines the management of marketing collateral from initial design to final distribution.